Are you looking for a legitimate Christian dating site? Is this the reason why you’re at this Christian Connection review? If so then the information below will help you understand what’s in store once you sign up! It can be daunting to date nowadays because of your busy lifestyle. Fortunately, there are now a lot of online dating sites today that cater to Christian singles. These dating sites will surely help Christian Singles to still practice their values because their matches will be likeminded like them. One of the online dating sites that is dedicated to Christians is the Christian Connection. But before you get all giddy and excited, then it would be best to read this Christian Connection review. 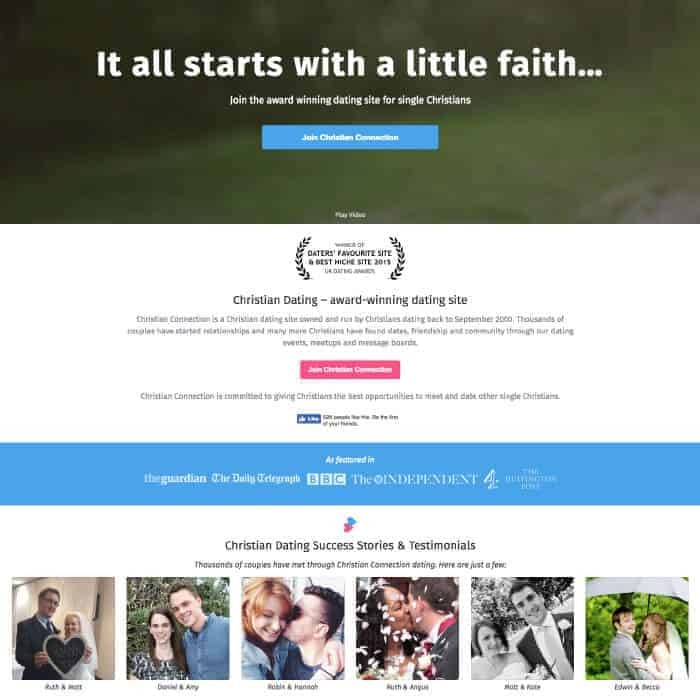 Christian Connection was established in the year 2000 and is one of the most popular online Christian dating sites. They cater to assisting Christian singles to find individuals who are like minded, for marriage, romance, dating, and as well as friendship. Christian Connection has been active for two decades already, which is one of the reasons why they are the leading in this niche. In fact, thousands and thousands of couples have already developed a serious and happy long-term relationship. Christian Connection has members from seven different countries, which is a great way to reach people outside of their respective countries and meet other single Christians as well. It’s always nice to get to meet Christians from all over the globe. International Community — One of the best reasons as to why you should choose Christian Connection is because as mentioned above, members here come from wide variety of religious backgrounds, traditions, and denominations. LGBT Friendly — Another good thing about Christian Connection is that it is LGBT friendly. This simply means that every one is definitely welcome here. Communication Options — There are also different communication options on Christian Connection. They have direct message, pre-configured messages, discussion boards, and a whole lot more. Signing up on Christian Connection is free and as well as creating your own profile. But if you want to enjoy more features, then subscribing to their paid membership. Once you have signed up and created your profile, the next thing that you need to do is to upload a photo of yourself. A current photo will definitely work, instead of just uploading a photo from a year or more before. You can find matches on Christian Connection in two different ways. The first one would be by getting a weekly matches, wherein the site will be sending the matches to you by email. Of course, you will also have the option to just search on your own using the site’s search tool. You can also guide the search tool on Christian Connection and this is by setting a custom preferences and criteria. If you are under a paid subscription, you will have the ability to see people who are online. This will help you see the members with whom you should talk to if you want to immediately start conversing with someone. Another good thing for having a paid subscription is that you can mask your profile when checking out profiles of other members. This will avoid letting them know that you’re checking them out. When it comes to starting a communication on Christian Connection, it’s pretty easy. As mentioned above, you can use direct messages to members that you want to communicate with. You also have the option to post on the site’s community boards and wait for a response. Now, if you are someone who is not sure on how you can start a conversation, then you can use the pre-configured wave message. This will give you a casual and safe way to let a member know that you are interested in them. Now, when it comes to exchanging unlimited messages and posting freely on the community boards, only the paid members are allowed to do these things. They can also reply directly to messages using their own private emails if they want to. If you are currently away from your computer, then don’t worry because Christian Connection review will send you a text message alert if a member sends you a direct message or a wave. Forum — In this forum page, you will have the ability to participate in the discussions, or you can always start a new one. Typically, the forum is packed with topics on religious beliefs and as well as Christianity. Regular Polls — There will be polls on the sit where you can express your thoughts on different things just by voting. Some of the polls will also include current affairs, hot questions, and other where you can react on. Spiritual Life Section — You will get to talk with other members in this section, including your personal beliefs, church, and faith. One of the good things about this feature is that it may help you find someone who shares the same views as you have. Online Now — As the name says, this feature is where you can see the people who are online. This will help you get to know the ones you can immediately chat with. Favorites — Just like in other online dating sites, Favorites is also included in Christian Connection. This is where you can create a list of your favorite members so you can easily chat them later on. Communication — You will be able to communicate with other members via instant messaging and as well as email messaging. Search — When it comes to the search feature, you can use different filters to find the match that will pass your preferences. Some of the filters will include, profile with photos, Christian faith, online members, relationship type, location, gender, and as well as age. Matchmaking — If you are too busy to browse through the hundreds of profiles on Christian Connection, then worry no more because the Matchmaking feature will help you find a match for you. The site will be sending you profile matches on a daily basis. Detailed Profiles — Of course, this feature is one of the best because this simply means that you will get to know the member just by reading the profile. The same goes for you because you will need to fill up your profile for other members to get to know you as well. The profile will include your appearance, beliefs, lifestyle, faith, hobbies, personality traits, and so on. This also means that you need to complete your profile and that might take a lot of time. Of course, a good online dating site should have a good customer service support. They have a help desk section, which will carry all of the answers to the most common questions that you have. But if the answer is not there, you can always ask assistance by sending an email to the customer service support. Members under a paid membership will be prioritized. If you are looking for a live chat support, I’m afraid because they don’t have that option. One of the best things about Christian Connection is that they will give the member a total control on the visibility of their profile. You have the ability to hide all of the information that you like from certain members. You can even block the members so you won’t be able to communicate with them anymore. Christian Connection has a report button, which will help alert the staff of Christian Connection against inappropriate content and behavior, offensive, and rude members or posts. In this way, the staff can conduct an investigation bout it. These are all of the information that you need to know about Christian Connection. With this Christian Connection review, you surely know now what to expect. Start finding your match by hitting that sign up button.